The 10 Best Kid-Friendly Dentists in Delaware! Getting your kid to the dentist can be a challenge. But tooth decay and damage are even more of a challenge to deal with. That’s why it’s important to find an excellent dentist. Delaware is home to a variety of kid-friendly pediatric dentists that will put your child at ease right away. Here are our favorites. Founded in 1995, the team at Gentle Touch Smiles provides comprehensive dental care for infants, children, and teens, and kids will enjoy the gentle, fun, and family-friendly environment. The Gentle Touch staff incredibly patient, and their approach is gentle, calm, and smooth, with no surprises. For more than 10 years, Dentistry for Children has been dedicated to pediatric dental care, and Dr. Rachel Maher diagnoses and treats a wide range of children’s dental health issues experienced from birth through the teenage years. 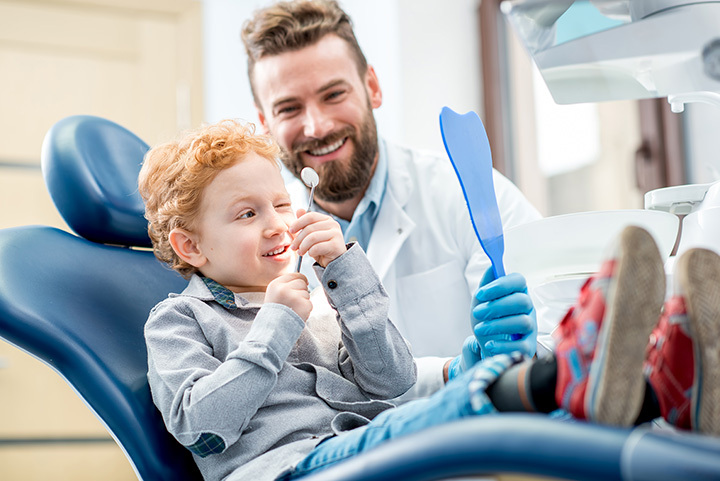 With a kid-friendly staff and a doctor with what patients describe as a “great bedside manner,” they take their time explaining dental hygiene to children. For 25 years, the award-winning couple of Dr. Tim and Dr. Rose have cared for you and your family like one of their own, from the appearance of the first tooth right on through adulthood. One of the few dentists who specialize in special-needs dentistry, they also offer many cosmetic services as well as preventative ones, including cleanings and x-rays. Doctors Robert and Dale Collins specialize in pediatric dentistry, with over 50 years of combined experience. They strive to provide quality and compassionate pediatric dentistry for children in a warm, welcoming, and child-friendly environment and want to make every dental visit a positive one. From prevention to early infant oral care, their website is stuffed full of helpful information. Dr. Arrighi is a graduate of the University of Scranton, and he is a member of the Academy of General Dentistry and the Delaware State Dental Society. His warm and diligent team has over 50 years of combined dental experience and they enjoy working with people of all ages—toddlers to retirees. From toddlers to the elderly, the practice believes that dental health is linked directly to overall health. At Smile-to-Smile, they use state-of-the-art, digital equipment to restore and enhance the natural beauty of your smile. Offering a wide range of sedation services while strictly adhering to safety and infection control practices, this general practice specializes in a clean, professional environment that lets you know you are in the care of professionals. At Brafman Family Dentistry they offer state-of-the-art equipment in a relaxed environment. With unsurpassed customer service, they offer preventative dental care, urgent dental services, cosmetic dentistry, preventative education, and more. Also find temporomandibular joint therapy, emergency services, and pediatric dentistry. With a motto of creating confident smiles, the Oral Health Center of Delaware has a caring and knowledgeable staff. The comfort of patients is the top priority at this office. From infants to teens, the doctors here will provide a painless experience. For the little ones, there are toys, activities, and an inviting atmosphere with fun decorations. With a warm, welcoming, and supportive atmosphere, Steve Alban is a top choice for family dentistry in Delaware. Services include preventative dental care, cleanings, oral hygiene instruction, fillings, night guards, and more. The team at Steve Alban Family Dentistry will prioritize the health, happiness, and comfort of your little one! The Delaware Smile Center has received numerous accolades for its outstanding work. A comfortable experience and beautiful smile are top priority here. With state-of-the-art technology and an expert staff, you’ll enjoy going to the dentist at the Delaware Smile Center.